Yesterday I sat down with my cards just before I did my meditation and selected The Magician (reversed). Today, I shuffled a different deck of cards (my Mystic Faerie Tarot by Barbara Moore), and selected the Magician (reversed) again. So, there must be a message here for me. In its upright position, the Magician is about using the gifts and tools you have to take charge of your life so you can create your own destiny. 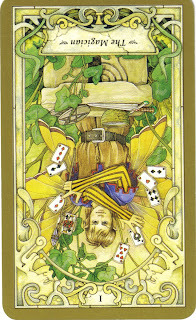 When reversed (upside-down), it can mean that you are somehow blocked and not using all of your available resources, experience, wisdom, gifts or tools to move you forward. You have all of the ingredients, but haven't quite figured out how to create a delicious masterpiece. This is a reminder to you to fully use your gifts. You've only begun to uncover what all is available to you. Step into it further and know that more tools will appear when you need and ask for them and also that you are barely using the abilities of the tools you have available now. Make it your quest to deepen your learning and application of these gifts. You have everything you need. The time now is to apply it. As you read through this, I have a feeling some ideas popped into your mind about what gifts you have that you'd like to use or learn more about. Take note of at least two gifts/tools that you'd like to have or ones you already have, but would like to deepen your knowledge and expand. By the end of the week, take at least one step forward to gain more information on these tools (check out a book from the library, do some Internet research, talk to someone who uses these tools regularly, etc.) and/or purposely use the tools/gifts you have but may not be using. Even if you are not an "expert," play with it; try it out. Have fun! This might be pulling out a deck of your own tarot cards and pulling and interpreting a card, using an energy technique you learned a long time ago but haven't used in a while, or perhaps something like writing a short story or drawing a picture. I have been practicing with a tool that I learned last year called PSYCH-K. This is a simple process to help people balance for beliefs they have that are driving their lives. It is like re-writing the software of your brain. I was timid about integrating it into my life coaching and tarot reading, but have just recently dusted it off and have been trying it out. Just last week, I met with a handful of friends and with each of them we balanced for beliefs around such things as being happy in a marriage, grief issues and losing weight. Just today, one of them said they felt the new beliefs were working in her life. Celebrate! Whatever gifts you have, The Magician (reversed) reminds you that NOW is the time to bring these out and let them shine. I love this card - even when it is reversed :) Nature has been giving me this same message all summer with BlueJay. One of Blue Jay's many messages is that we can either be jack of all trades and master of none, or we can become a master of our trade. So this card is again reminding me to deepen my mastery in areas I've been studying by using the information and tools I do have and to stop looking for "new" ways for now. Master what I know because for right now it is enough...versus looking for new answers and skills. It's amazing. Every Tuesday I check and every Tuesday I find that the card you pull has a message for me at just the right moment...I have not yet created my masterpiece (aka baby) and I was blocked (hormonally and emotionally) yesterday, but today am moving through the block...the tools and resources I am using? Well, more than two, but the main ones are simple: journalling (via my blog) and rest. And they have both helped immensely! At first, I thought this was about my husband, Magic, who I got in a fight with last night (hee hee)! Seriously, I'd like to develop my intuitive abilities more. I know I have them, but my logical mind is always questioning my intuitive mind. Maybe there is hope? I feel like I'm in a place where I simply don't have time to hone any skills or work toward new ones. I guess that's my block. If I were really motivated, I'm sure I could carve out some time. I always look forward to "intuitive Tuesday". It always speaks to me. Lately I've been looking for a job and everytime I apply for a job I feel like I'm one in hundreds and there is nothing special about me that would stand out. I'm trying to change my train of thought to "I do have a lot to offer an employer and the right one will come along when the time is right". I need to hone my gifts of communication and having confidence in myself. This post makes me think that maybe areas I've criticized in myself might be gifts. I have a rather scatter-shot approach to life. When cleaning my house I'll work in one area until something else gets my attention; I'll skip over to Something Else, until another something else calls. Generally, by the end of the day, all of these something elses have met in the middle and I have a clean house. I used to condemn this style, though, thinking there was something lacking in not working on one part until it was completely finished before moving on to the next (and the next should be in a logical sequence). Putting together a difficult jigsaw puzzle last week helped meto see that this might be a style that works best for me...and that metaphors are powerful gifts and tools! Amen to that! What you wrote in your diary fits me perfectly!!!! I need to master the tools and skills I already have... and to believe in myself!!!! I love Intuitive Tuesday... and you! Well, it's a good thing I've put my nose to the grindstone lately! I wonder if there is something else more deeply hidden in me that I could bring out. Well I came and checked out your "Intuitive Tuesday" post so the Magician Reversed must be meant for me too. And it's funny how affirming this reversed card is in it's reminding us of our gifts. So I will take stock and maybe just consider an attitude shift. I like your perspective Excavator and wonder if there might be something in it that fits my life too. Like excavator I am a scatter shot housekeeper, when I get to it, but find that that approach works when I allow it to. I live under an umbrella of constantly questioning and doubting my ways and as a result often don't even take note of my gifts. So this card is definitely one to muse about.